The Denton City Council District 1 seat is up for election this year, and the two candidates seeking the position are incumbent Gerard Hudspeth and Denton business owner George Ferrie. The District 1 seat covers central and southeast Denton and has been represented by Hudspeth since 2017. Earlier this month Hudspeth, 46, announced he will seek a second term and a campaign launch will take place from 6-8 p.m. Thursday, Feb. 7 at Harvest House. Hudspeth, who said his platform will be a continuation from his time on city council and the previous election, will focus on growth management, affordable housing and increased transparency. Hudspeth said the measure to disclose travel arrangements is “invaluable” in terms of transparency and acknowledged it failed to gain support among other city council members. Hudspeth said he also hopes to address council members’ ability to issue “motions to reconsider.” Under such motions, council members who voted in favor of policy may reconsider their votes and are not required to disclose why their votes changed. Hudspeth is looking to work with New Modern Home, a North Texas based company, to provide affordable, low maintenance housing. Hudspeth, who toured one of the houses with his staff, said a McKinney utility bill in August was roughly $22.50. Hudspeth said those numbers would look more like $15, as per the Denton general manager. Hudspeth said the company is committed to building in Denton and currently looking for available land to develop. Ferrie, 31, announced his intention to run for District 1 last December and kicked off his campaign during an event earlier this month held at Denton County Brewing Company. Ferrie’s platform for Denton City Council calls for expanding LGBTQ protections through nondiscriminatory policy, strengthening tenant rights, sustainable infrastructure and public safety. The Human Rights Campaign, the nation’s largest civil rights organization for LGBTQ equality, rates cities and states based on their laws, policies and services that support members of the LGBT community. Denton is rated 52 out of 100. Currently, no policy protections for either employment, public housing or accommodations for members of the LGBTQ community in Denton is present. Across North Texas, Dallas and Fort Worth are the only cities to receive a perfect score. 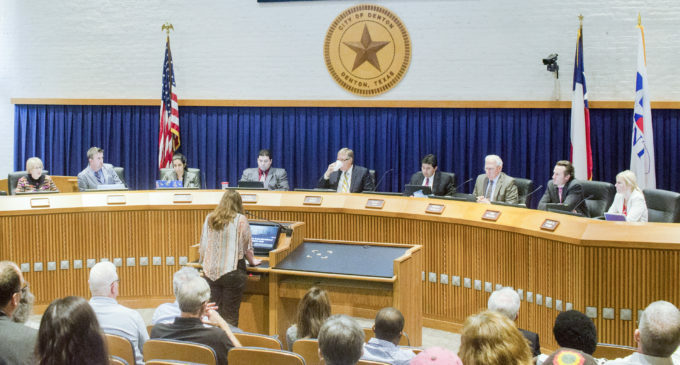 Speaking on the issue of tenant rights in Denton County – where 53 percent of residents are renters – Ferrie, a renter himself, said expanding knowledge about community programs would be beneficial. Residents in Denton may contact Community Improvement Services and request inspections for violations at interior rental properties, such as broken appliances, mold, faulty heating and air conditioning and malfunctioning plumbing and electrics. Likewise, the city also provides assistance for low- and moderate-income homeowners who cannot afford to complete repairs through Home Repair Assistance. The program, which repairs or modifies homes to protect the health and safety of the structure and household, includes damaged or exposed electrical wiring, leaking roofs, building wheelchair ramps and widening doorways to rooms for more accessible living. During the 2017 election for city council, District 1 saw the lowest voter turnout compared to other districts. To increase voter turnout this election cycle, Ferrie said his campaign will hold events to register voters and inform them about his plans. Featured Image: City Council in session. File.